In thinking about what to do for a vacation, I have been curious for some time about singing holidays. In England there are lots of Summer Courses where amateurs can get together, learn more about singing and rehearse intensively with leading professionals – while staying in lovely mansions and enjoying the good company. I looked at the ones held at Dartington in Devon, but settled for one run from England by Lacock.org (which is really one man, Andrew van der Beek). They use a variety of interesting venues outside the UK. 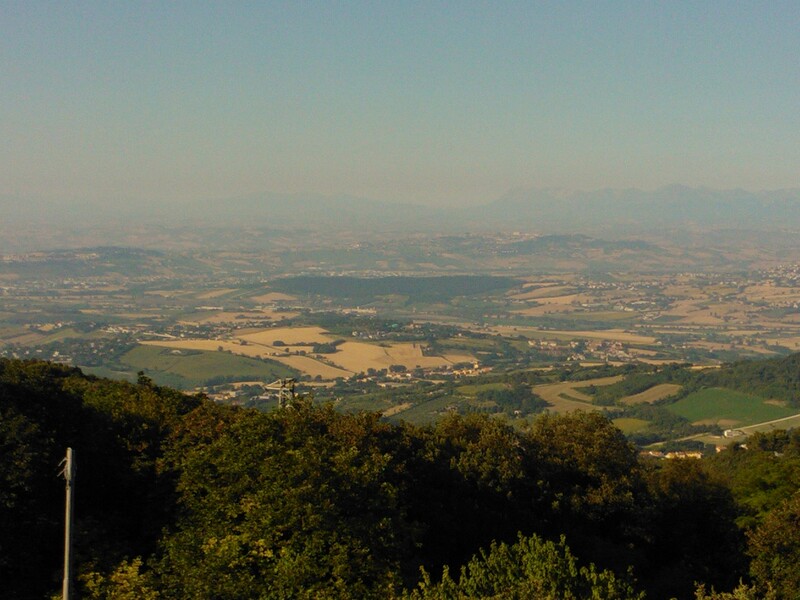 The course I chose was called “Music at Monteconero” This would run for a week (Sunday to Saturday) in late June at Monteconero Abbey, which is near Ancona on the Adriatic (east) coast of Italy, south of Rimini and north of Pescara. 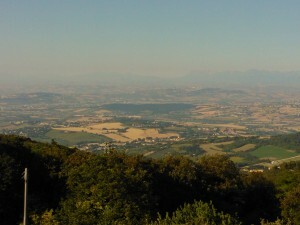 In fact the Abbey is on the top of a hill right on the coast, which commands wonderful views of the ocean on one side and the patchwork country side on the other, with the Apennine Mountains in the distance. The Abbey itself is very simple, but the Monastery attached has been turned into comfortable suites. Since the restaurant had a reputation for fine food, it seemed the ideal place for a musical get-away! The way singers were selected seemed very British, in that applicants were expected to conform to the requirements, but no testing or recommendation was required. As the 32 singers began to assemble on the opening Sunday night, I saw that in fact the predominant age group was the over-60s, and most people were retirees, participants in good amateur choirs where they lived. The majority were from the UK – from all over – but there were 2 Germans, 2 Dutch, 2 Americans from New York, 1 from Israel, and 1 from Brazil (me). The conductor chosen for this course was Patrick Craig, a professional musician who sings counter-tenor in The Tallis Scholars (a very fine group that sings early music) and conducts the Aurora Nova, a leading all-female choir which sings regularly in St. Paul’s Cathedral. He had chosen as the musical theme “When David heard” which was widely used by composers after the death of Prince Henry in 1612. (He was just 18, a very popular figure, and his passing provoked a national outpouring of grief rivalled only in our times by the death of Princess Diana). Various treatments of this theme (including a modern one) had been assembled into a booklet, and the nearly 90 pages of music(!) were distributed to participants some weeks before the course. The singing sessions were scheduled for 9:30am to 1pm (with a half-hour break for coffee) and 5pm to 7 pm in the evening. The rest of the time was free, but since there was a fine pool and some Italian early summer sun, it was irresistible to laze round it during the afternoon, swapping experiences with some very interesting people! 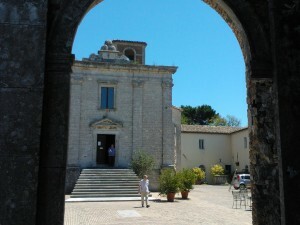 The morning session started with loosening-up and vocal exercises in an old courtyard, under the trees (no rain while we were there), and then we moved into the Abbey. On the first day the participants were introduced by Andrew the organizer (also a fine tenor), and I discovered that several had done a previous course there. The required equipment was just the musical score, a bottle of water, and a pencil. The first morning had the thrill of “what’s going to happen now”?, and my curiosity was heightened on finding there was no musical instrument in the Abbey – no piano, no organ – so the tone was set by the conductor’s tuning fork, and his singing some important starting notes. Would we run through it voice by voice? Would we stay in tune or lose the pitch? 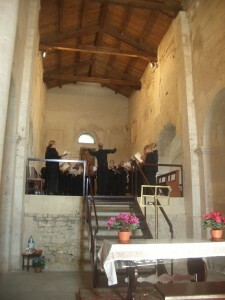 The first song was a plainsong chant in unison, which the choir read as if they had been doing it for years – and then Patrick gave the page of a Motet, sang the starting notes, raised his arms – and the choir sang it all in 5 parts with only one doubtful patch, and got to the end without losing pitch at all! Wow, I thought, this is something different! By the time the concert came, all the pieces had been gone through four or more times. One piece in particular stood out – a “When David heard” by contemporary Californian composer Eric Whitacre. Completely different from the old-time pieces, this had unusual sequences of notes, tricky rhythms, and divided and divided the voice parts in some passages so that practically every individual in the choir was singing a different note! But he used the repetition of this mélange of sound in a big crescendo, which suddenly resolved itself to a recognizable strong chord at full voice…. then went to short agonized phrases interleaved with silences – while the echoes died away in the rafters of the old Abbey. As an expression of grief, it was strong stuff, and was the piece which most moved the audience. The audience? Well, although there had been some publicity locally, that was not really the term – there were fewer people than in the choir, but they were appreciative! After a celebratory dinner post-concert, by midday on Saturday the choir had dissolved again – again in true British fashion, without big goodbyes or promises to keep in touch. It was great but that was it. Two things impressed me particularly – first, the strength of amateur choral singing as an activity in England, especially for senior citizens. There are lots of choirs, lots of professional musicians ministering to them, a great deal of knowledge of music both old and new – and organizations making a business out of it. Second, the competence in reading music. It is a general skill amongst choir members, but in the good choirs they sing a score unaccompanied with as much ease as reading a book. In fact, our conductor Patrick Craig said he preferred the concerts where his own choir had not rehearsed at all – but just taken the music and sang it. He loved the spontaneity! Apparently they made a concession at Prince William’s Wedding Ceremony in St. Pauls – they actually ran through the music the morning before….! This entry was posted on Thursday, September 20th, 2012 at 10:17 am	and is filed under Uncategorized. You can follow any responses to this entry through the RSS 2.0 feed. Both comments and pings are currently closed.